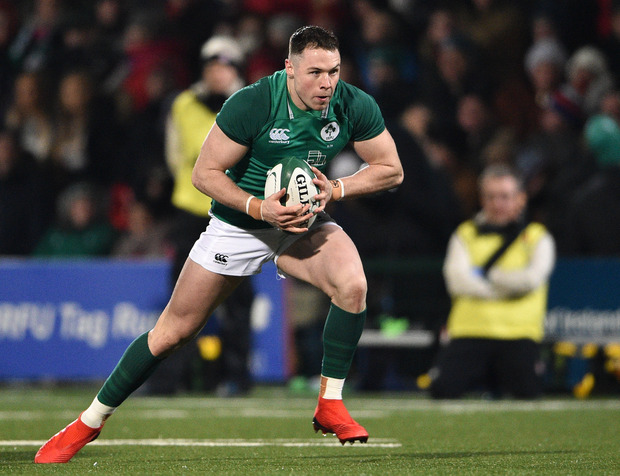 Sean French pressed his claims to feature for the Ireland Under-20s against France in his native Cork on Friday with a two-try contribution in Cork Constitution's 15-7 All-Ireland League win over Garryowen. Fresh from training with the Ireland U-20s against Joe Schmidt's men in Belfast, French slotted in on the right wing for Cork Con at Dooradoyle and scored a try in each half as they retained their eight-point lead at the top of Division 1A. Aidan Moynihan and Peadar Collins swapped earlier tries with Garryowen losing ground in the play-off race. Second-placed Lansdowne matched Con in bouncing back to winning ways with a tense 25-24 victory at home to relegation-threatened Young Munster. The Cookies came away with two bonus points, but Scott Deasy's 73rd-minute penalty proved decisive. Replacement out-half James Fennelly also landed a crucial late penalty for semi-final-chasing Dublin University who pipped Terenure College 10-7, while wingers Michael Clune and Matt Bowen scored the only tries in UCC's 15-3 defeat of Shannon. Leinster Academy scrum-half Paddy Patterson's first-half brace was overshadowed by Clontarf's trio of second-half tries as they beat UCD 26-17 at Belfield. Meanwhile, Old Wesley have opened up a four-point lead at the top of Division 1B after overcoming Banbridge 22-0. Paul Harte scored the first of their three tries. Ulster's Johnny McPhillips kicked two penalties and converted Zack McCall's try in Ballynahinch's 13-5 comeback win over Naas. City of Armagh won 27-15 in their Ulster derby clash with Ballymena, aided by Neil Faloon's fourth try in five games. Winger Mark Balaski scored the only try in Buccaneers' 11-6 triumph at Malone.